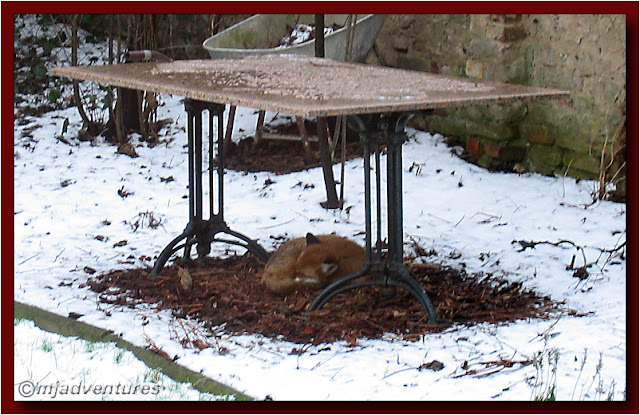 On some cold and snowy days, we had a visitor to our back yard – a cute little fox that we called Samantha. She’d sleep all day under the shelter of the table and then disappear at night to go hunting. We were honoured that she felt safe enough to stay in the yard – even though she could see us moving around in the house. She was bothered one day by a stupid man who walked into the garden to get a closer look at her, and all she did was get up slowly, jump onto the wall and make her way out of the yard into the woods behind the house. Foxes in Berlin roam the streets in some areas - they make you look twice because at first glance you think that they are dogs, and then your brain tells you that there's something wrong with what you're seeing!